In this issue, ReefNews brings you two excellent pictures from the vibrant reefs of Grand Turk, just in time for Christmas. 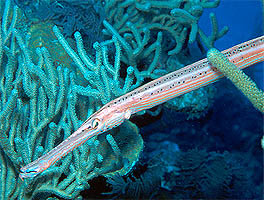 The Trumpetfish is a common fish we've seen in other ReefNews webpages. But this Trumpetfish picture from The Aquarium reef is one of the best. Coral Gardens near Grand Turk has some of the healthiest corals in North America. 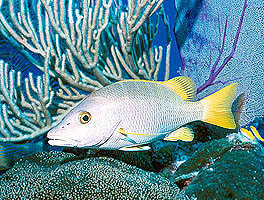 Click here to see this Schoolmaster and friends near some beautiful corals.